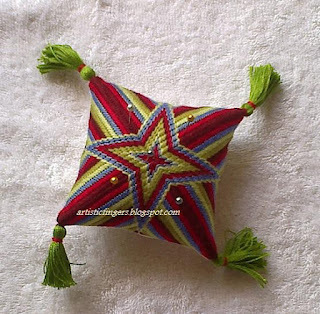 Another pin cushion of mine….. 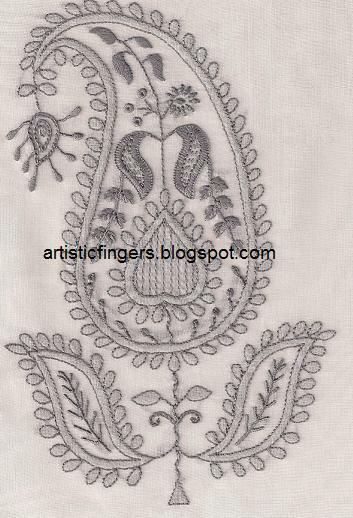 This is the last lesson of our chikan embroidery sal. 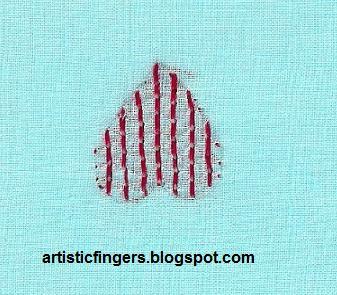 Let’s learn eyelet and wave stitch filling today. 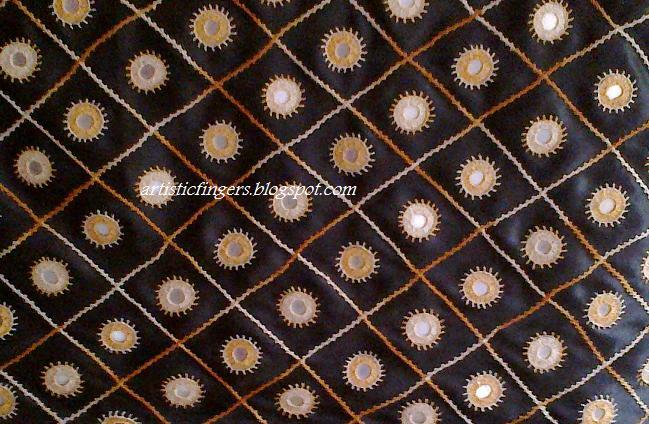 1.The three small black circles which are marked as ‘L’ in the design (refer stitch guide) has to be completed with eyelet stitch. 2. 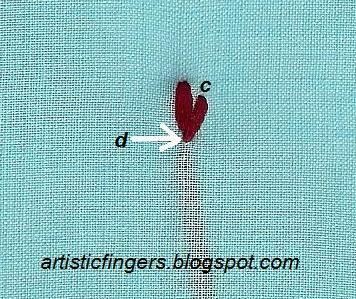 The heart shaped center which is marked as ‘O’ in the design (refer stitch guide) has to be completed with wave stitch filling. 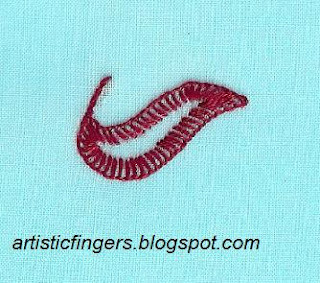 To practice this stitch transfer design no. 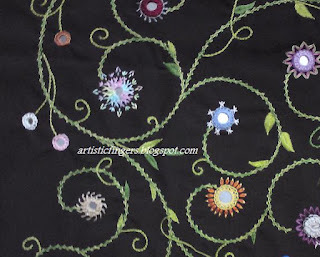 15 from the practice designs onto your doodle cloth, follow the instructions below and stitch. 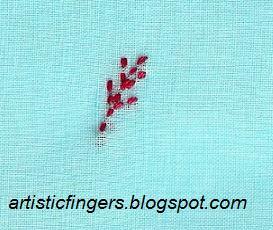 Step 1: Work tiny running stitches on the outline as shown in the image above. 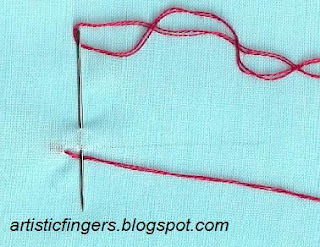 Step 2: With a sharp or crewel needle punch the center of the circle, pass the needle up and down a couple of times so that a hole is formed in the center. Step 3: Work small overcast/satin stitches by going down into the hole and coming up outside the running stitch outline and complete the circle. 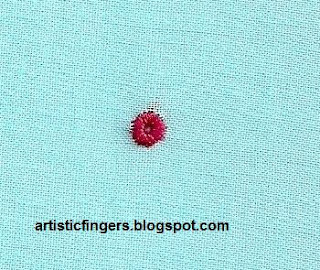 Complete the three small black circles which are marked as ‘L’ in the design (refer stitch guide) with eyelet stitch. 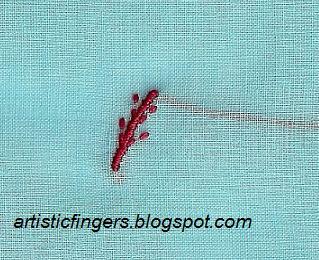 Complete the small stems with stem stitch. 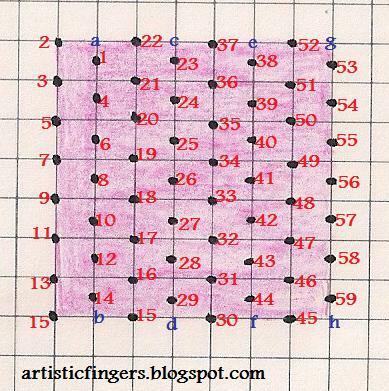 To practice this stitch draw a square grid ( 1cm squares),follow the instructions below and stitch. Once you understand the rhythm of the stitch then practice on design no 16a and 16b from your practice designs where the grid is smaller in size. 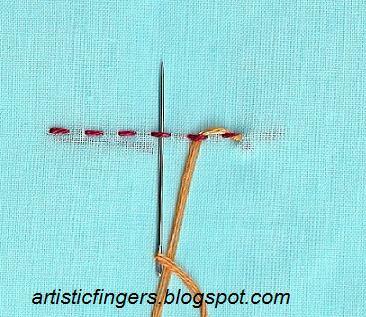 Note: When you bring the needle and thread up always pull the thread little tighter so that a hole is formed. Row 1: Bring the needle and thread up at ‘a’, go back down at 1, come up at 2, go back down at 3, come up at 1, go back down at 4, come up at 3, go back down at 5, come up at 4, go back down at 6, come up at 5, go back down at 7, come up at 6, go back down at 8, come up at 7, go back down at 9, come up at 8, go back down at 10, come up at 9, go back down at 11, come up at 10, go back down at 12, come up at 11, go back down at 13, come up at 12, go back down at 14, come up at 13, go back down at 15, come up at 14, go back down at b. Now we’ve finished row 1 stitching from top to bottom. The 2nd row has to be worked from bottom to top. Row 2: To start the second row, make a tiny stab stitch close to ‘b’ and come up at ‘b’ again, go back down at 14, come up at 15 (marked between ‘b’ and ‘d’), go back down at 16, come up at 14, go back down at 12, come up at 16, go back down at 17, come up at 12, go back down at 10, come up at 17, go back down at 18, come up at 10, go back down at 8, come up at 18, go back down at 19, come up at 8, go back down at 6, come up at 19, go back down at 20, come up at 6, go back down at 4, come up at 20, go back down at 21, come up at 4, go back down at 1, come up at 21, go back down at 22, come up at 1, go back down at a. 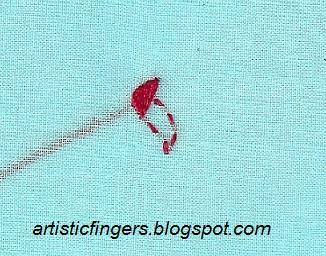 Now we’ve finished 2nd row stitching from bottom to top. The 3rd row has to be worked from top to bottom. Row 3: Make 2-3 tiny stab stitches and then come up at c, go back down at 23, come up at 22, go back down at 21, come up at 23, go back down at 24, come up at 21, go back down at 20, come up at 24, go back down at 25, come up at 20, go back down at 19, come up at 25, go back down at 26, come up at 19, go back down at 18, come up at 26, go back down at 27, come up at 18, go back down at 17, come up at 27, go back down at 28, come up at 17, go back down at 16, come up at 28, go back down at 29, come up at 16, go back down at 15 which is marked between ‘b’ and ‘d’, come up at 29, go back down at ‘d’. 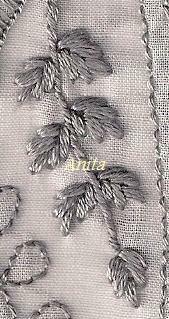 We’ve finished the 3rd row stitching from top to bottom. The 4th row has to be worked from bottom to top. 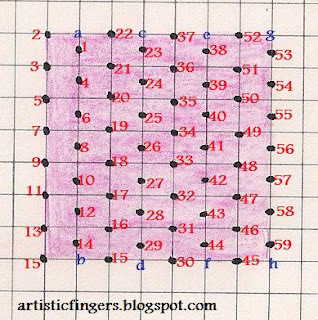 Row 4: To start the fourth row, make a tiny stab stitch close to ‘d’ and come up at ‘d’ again, go back down at 29, come up at 30, go back down at 31, come up at 29, go back down at 28, come up at 31, go back down at 32, come up at 28, go back down at 27, come up at 32, go back down at 33, come up at 27, go back down at 26, come up at 33, go back down at 34, come up at 26, go back down at 25, come up at 34, go back down at 35, come up at 25, go back down at 24, come up at 35, go back down at 36, come up at 24, go back down at 23, come up at 36, go back down at 37, come up at 23, go back down at ‘c’. We’ve finished the 4th row stitching from bottom to top. The 5th row has to be worked from top to bottom. Row 5: Make 2-3 tiny stab stitches and then come up at ‘e’, go back down at 38, come up at 37, go back down at 36, come up at 38, go back down at 39, come up at 36, go back down at 35, come up at 39, go back down at 40, come up at 35, go back down at 34, come up at 40, go back down at 41, come up at 34, go back down at 33, come up at 41, go back down at 42, come up at 33, go back down at 32, come up at 42, go back down at 43, come up at 32, go back down at 31, come up at 43, go back down at 44, come up at 31, go back down at 30, come up at 44, go back down at ‘f’. We’ve finished the 5th row stitching from top to bottom. The 6th row has to be worked from bottom to top. Row 6: To start the fourth row, make a tiny stab stitch close to ‘f’ and come up at ‘f’ again, go back down at 44, come up at 45, go back down at 46, come up at 44, go back down at 43, come up at 46, go back down at 47, come up at 43, go back down at 42, come up at 47, go back down at 48, come up at 42, go back down at 41, come up at 48, go back down at 49, come up at 41, go back down at 40, come up at 49, go back down at 50, come up at 40, go back down at 39, come up at 50, go back down at 51, come up at 39, go back down at 38, come up at 51, go back down at 52, come up at 38, go back down at ‘e’. We’ve finished the 6th row stitching from bottom to top. The 7th row has to be worked from top to bottom. Row 7: Make 2-3 tiny stab stitches and then come up at ‘g’, go back down at 53, come up at 52, go back down at 51, come up at 53, go back down at 54, come up at 51, go back down at 50, come up at 54, go back down at 55, come up at 50, go back down at 49, come up at 55, go back down at 56, come up at 49, go back down at 48, come up at 56, go back down at 57, come up at 48, go back down at 47, come up at 57, go back down at 58, come up at 47, go back down at 46, come up at 58, go back down at 59, come up at 46, go back down at 45, come up at 59, go back down at ‘h’. We’ve finished the 7th row stitching from top to bottom. 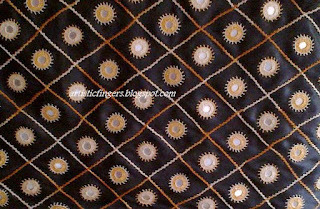 Note: If there are more than 7 rows required in a design please follow the same pattern and fill the design. 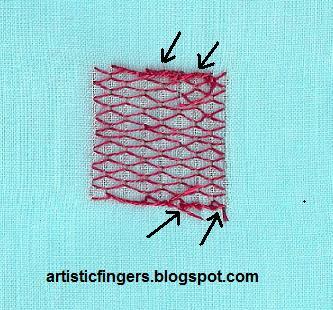 Wave stitch filling worked on design 16a is shown in the images below. 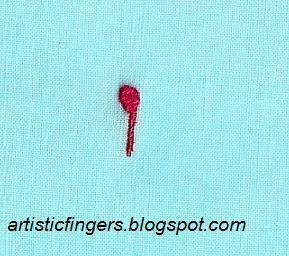 We might run out of thread while stitching. 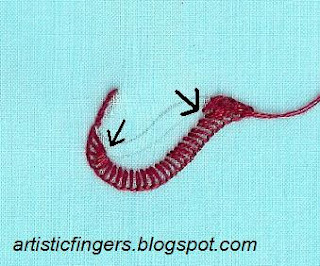 Do not end and start the thread in the middle of a row. Always start and end either at the top or at the bottom line. The black arrows indicate the starting and ending of threads and you can see the tails clearly in the image. Wave stitch filling worked on design 16b is shown in the images below. Note: When you are filling a shape other than square start at the center, complete one side, come up again at the center and complete the other side. 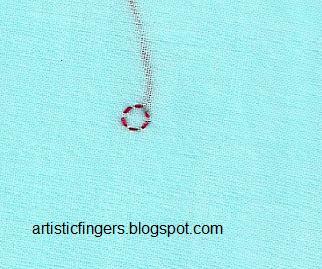 The tiny dots which you see on the outline are stab stitches. When you work on the paisley design make sure that you place these stab stitches under the double back stitch which we had worked already. Draw a grid and complete the heart shaped center which is marked as ‘O’ in the design (refer stitch guide) with wave stitch filling. 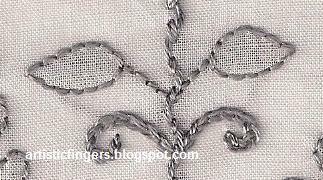 We had finished this stitch in the previous lessons where we learnt roman stitch and detached chain variation. 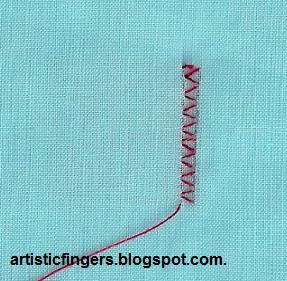 Complete the tiny stem of the flower stitch with stem stitch. 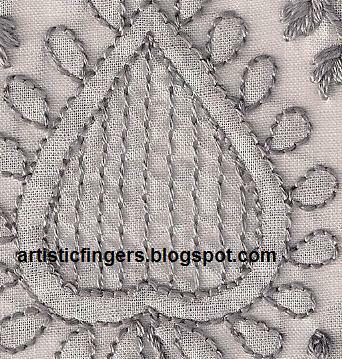 Thank you all once again for participating in the chikan embroidery sal .Hope this class was useful and interesting to everyone. Correction : Sorry about the two points marked as no.15 in wave stitch.Thanks Mary for pointing it out. 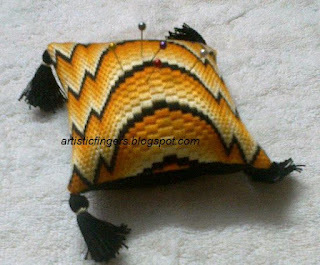 Did I tell y’all that I’m crazy about stitching accessories? This is one of my pincushions, it’s needlepoint embroidery. 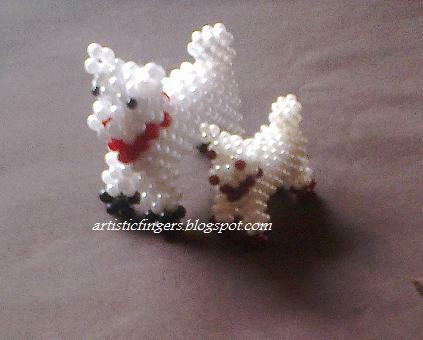 Look what my mom’ has made… They are so cute, aren't they? 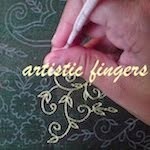 I’d like to share the images of my shisha embroidery cover and a WIP which is for my class later this year with y’all. Actually it’s a straight line but it looks wavy because of the wind and my photography skill J . 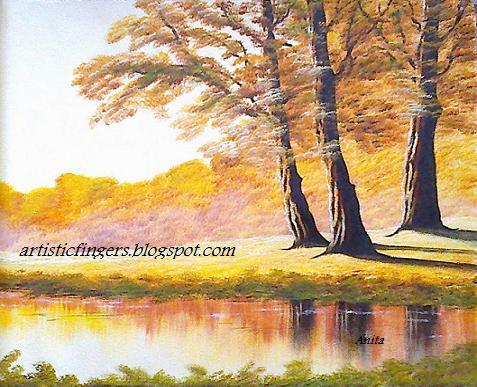 Which one do you prefer, monochromatic or multi colour one? 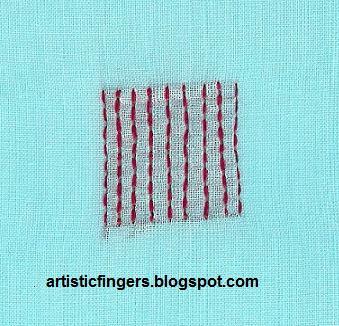 Let’s learn overcast stitch variation and satin stitch variation today. 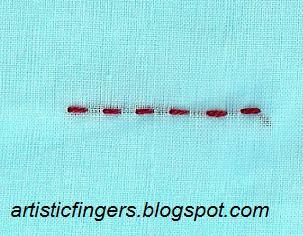 1.The vein which is marked as ‘N’(refer stitch guide) has to be completed with overcast stitch variation. 2. 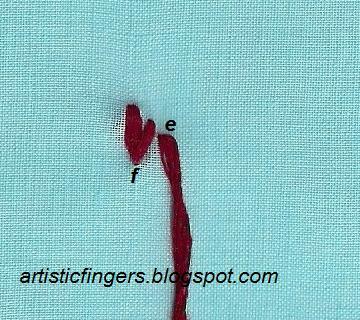 The line with a tear drop shape which is marked as ‘M’ (refer stitch guide) has to be completed with satin stitch variation. 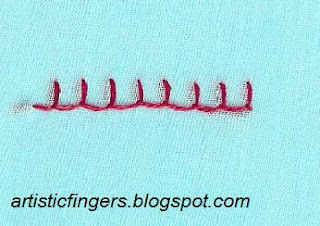 To practice this stitch trace design no.11 from the practice designs onto your doodle cloth, follow the instructions below and stitch. 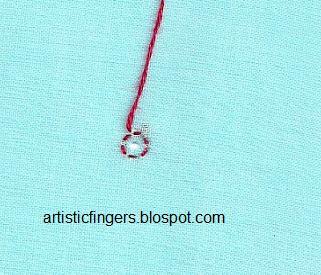 Step 1: Complete the design with running stitch as shown in the image above. 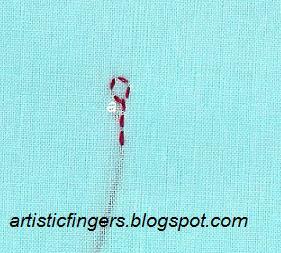 Step 2: Cover the running stitch on the vertical line with tiny satin stitch as shown in the image above. The satin stitch has to be perpendicular to the running stitch. Step 3: Cover the running stitch on the slanting lines on either side of the vertical line as shown in the image above. 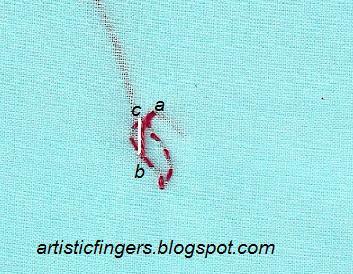 Complete the vein which is marked as ‘N’(refer stitch guide) in the design with overcast stitch variation. 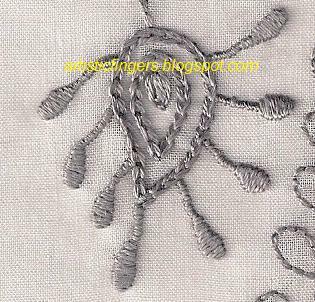 To practice this stitch trace design no.14 from the practice designs onto your doodle cloth, follow the instructions below and stitch. Note: Use the same no. 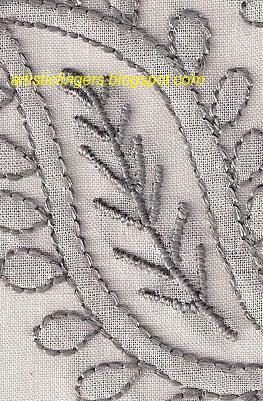 of strands for both running and satin stitch. 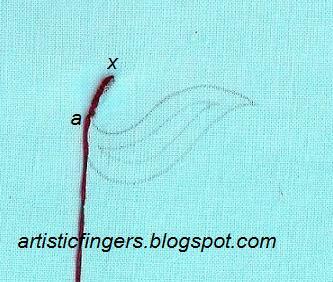 Step 1: Complete the design with running stitch starting from ‘a’ as shown in the image above. 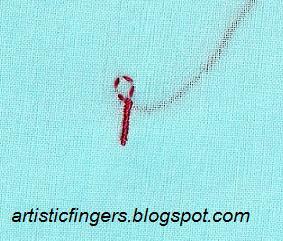 Step 2: Cover the vertical line with tiny satin stitch as shown in the image above. 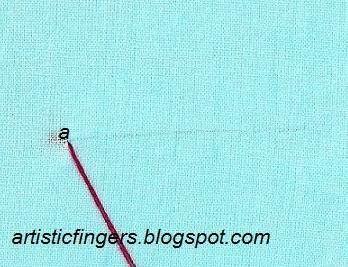 The satin stitch has to be perpendicular to the running stitch. Step 3: Cover the tear drop shape with satin stitch as shown in the image above. 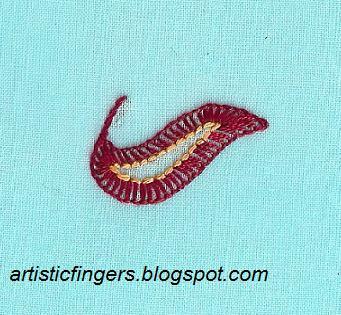 Complete the line with a tear drop shape which is marked as ‘M’ (refer stitch guide) in the design with satin stitch variation. 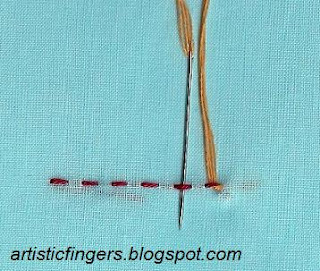 So, what’s the difference between these two stitches? 1. 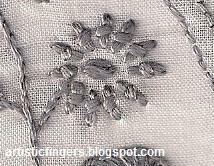 In overcast stitch variation the size of the satin stitch is the same throughout the design but in satin stitch variation the size of the satin stitch varies. 2. 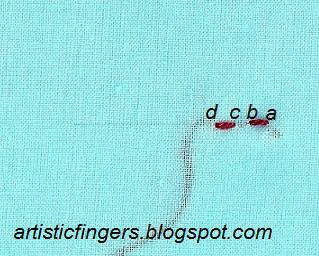 Overcast stitch variation is always worked on either straight or curved line designs. Satin stitch variation is either worked on designs either with a vertical line and tear drop or vertical line and small circles. Hope these instructions are clear. Please let me know if you think that I need to add more info. Today let’s learn straight stitch variation and slanting satin stitch. 1. 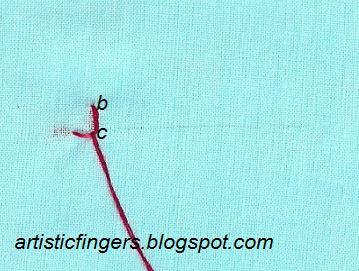 The cluster which is marked as ‘I’ and the three clusters on either side of 'P1' in the design (refer stitch guide) has to be completed with straight stitch variation. 2. The leaves which are marked as ‘G’ in the design and green coloured in your stitch guide (refer stitch guide) has to be completed with slanting satin stitch. 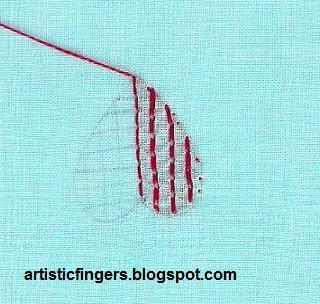 To practice straight stitch variation trace design no.12 from the practice designs onto your doodle cloth, follow the instructions below and stitch. NOTE: THIS STITCH IS ALWAYS WORKED AS A CLUSTER, EITHER 3 STITCHES OR 5 STITCHES ARE WORKED TO CREATE A LEAF SHAPE.THE MOST COMMON ONE IS 5 STITCHES CLUSTER WHICH IS SHOWN BELOW.THE LINE IN DESIGN NO.12 IN PRACTICE DESIGN INDICATES THE FIRST STITCH OF STRAIGHT STITCH VARIATION. 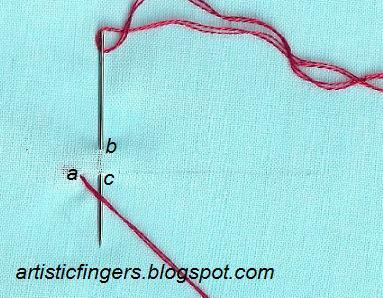 Step 1: Bring the needle and thread up at ‘a’. Go back down at ‘b’ which is indicated by an arrow. Come up at ‘c’. Step 2: Go back down at ‘d’. Step 3: Come up at ‘e’. Step 4: Go back down at ‘f’. Step 5: Come up at ‘g’, go back down at ‘d’, come up at ‘h’, go back down at ‘f’. Complete the cluster which is marked as ‘I’ and the three clusters on either side of 'P1' in the design (refer stitch guide) with straight stitch variation. Note: There are 3 tiny lines on either side of ‘P1’ in your stitch guide, those tiny lines indicate the placement of a cluster (straight stitch variation) and it doesn’t represent the actual stitch size. 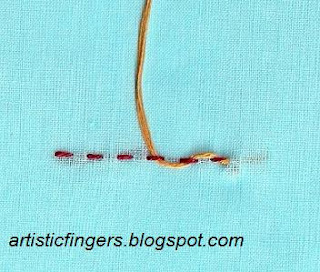 Your completed straight stitch variation has to be like this-see image below. In Indian surface embroidery satin stitch is used in four different ways- Horizontal, vertical/straight, slanting and surface.In Chikan embroidery slanting satin is used often,sometimes vertical satin is used.But horizontal and surface satin are used in other Indian embroidery not in chikan embroidery. 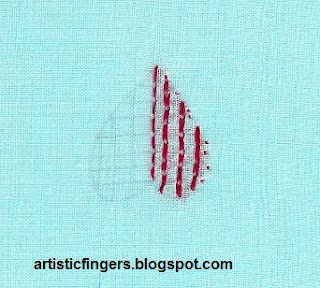 To practice this slanting satin stitch trace design no.10 from the practice designs onto your doodle cloth, follow the instructions below and stitch. 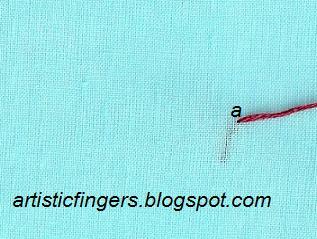 Step 1: Work a row of running stitches on the outline starting from ‘a’. Step 2: Come up at ‘a’. 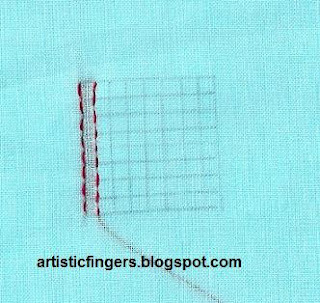 The white line indicates the direction of the second stitch. Step 4: Complete the left side like this, see the above image. 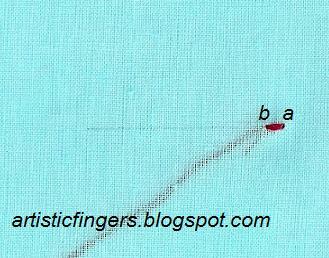 Step 5: Come up at ‘d’, go back down next to ‘b’ on the right side, continue like this and complete the right side. Complete the leaves which are marked as ‘G’ in the design (refer stitch guide) with slanting satin stitch –see the image below. 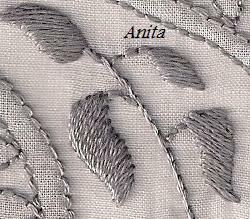 Notice the angle of the stitches in each leaf and complete yours. 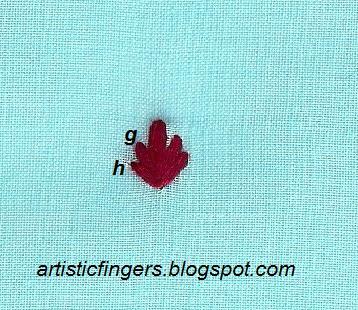 Complete the tiny stems of these leaves with stem stitch. Hope these instructions are clear. Please do let me know if I need to add any info in my instructions. If you have any doubts please send an e-mail to me. Hope y’all had a wonderful weekend. Got to go to my framer. Bye for now. 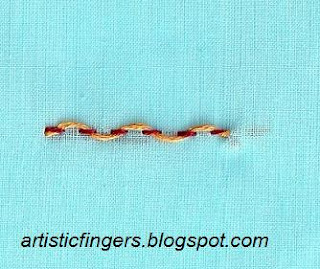 Today let’s learn blanket stitch, running stitch and laced running stitch or interlaced running stitch. 1.The leaf shape which is marked as ‘J’ in the design (refer stitch guide) has to be completed with blanket stitch. 2. 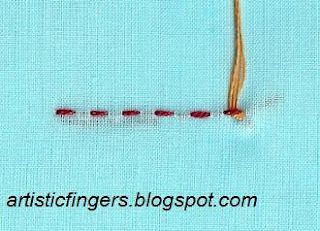 The space which is marked as ‘D’ in the design (refer stitch guide) has to be filled with two or three rows of running stitches. 3. 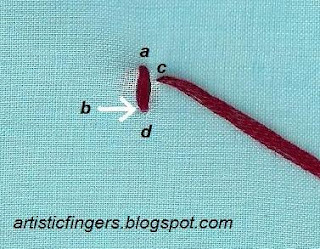 The line which is marked as ‘D1’ in the design (refer stitch guide) has to be completed with laced running or interlaced running stitch. 4. The triangle shape which is marked as ‘K’ in the design (refer stitch guide) has to be completed with double back stitch and back stitch. 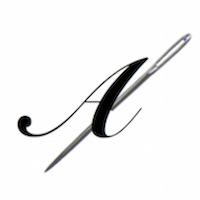 Step 1: Bring the needle and thread up at ‘a’. 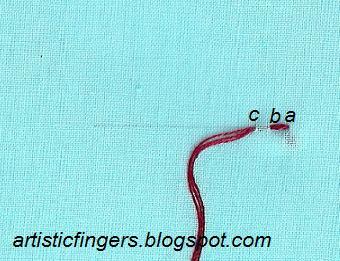 Step 2: Go back down at ‘b’ and come up again at ‘c’ as shown in the image. 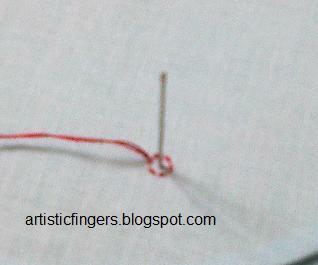 Step 3: Place the working thread under the needle as shown. 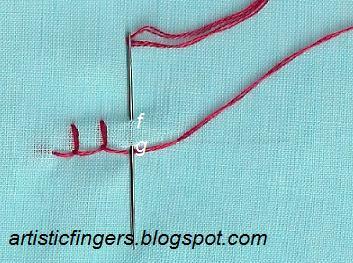 Step 4: Pull the needle and thread. Step 5: Go back down at ‘d’ ,come up at ‘e’ , place the working thread under the needle as shown and pull the needle and thread. 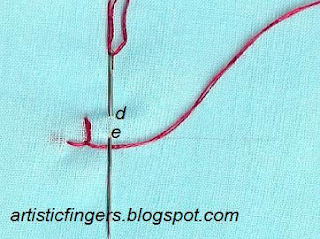 Step 6: Go back down at ‘f’ , come up at ‘g’ ,place the working thread under the needle as shown and pull the needle and thread. Continue like this until you complete the design. 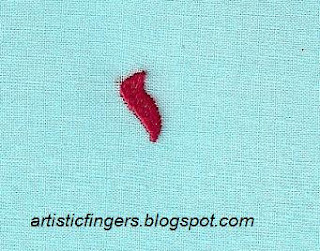 To practice blanket stitch trace design no.9 from the practice designs onto your doodle cloth , follow the instructions below and stitch. Complete the distance between ‘x’ and ‘a’ with stem stitch, do not end the thread and continue working blanket stitch with ‘a’ as the starting point. 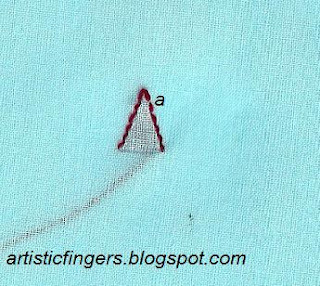 I’ve worked the blanket stitches little closer in the ends indicated by arrows to get the shape correct. Complete the leaf shape practice design with blanket stitch. 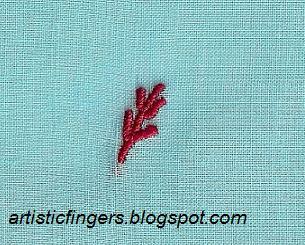 Now complete the leaf shape which is marked as ‘J’ in the design (refer stitch guide) with blanket stitch and work a row of back stitch as shown in the image below. NOTE: I’ve used two colours just to show the back stitch clearly. Do not use two colours in your project. 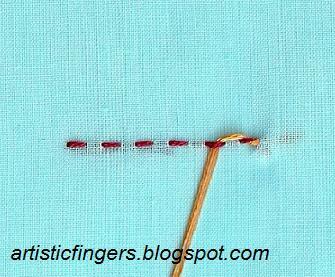 Complete the back stitch with the same colour which you’ve used for blanket stitch. 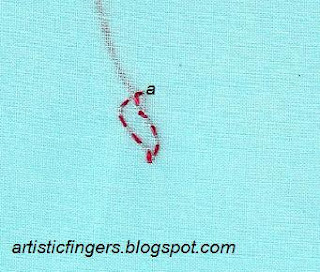 To practice this stitch trace design no.6 from the practice designs onto your doodle cloth ,follow the instructions below and stitch. Step 2: Go back down at ‘b’. Step 3: Come up at ‘c’. Step 4: Go back down at ‘d’. Fill up the space which is marked as ‘D’ in the design (refer stitch guide) with two or three rows of running stitches. 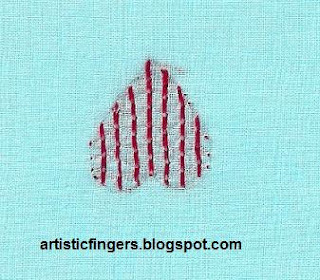 The leaf shape in the design with blanket stitch, back stitch and 2 rows of running stitches will look like this (see the image below). To practice this stitch trace design no.7 from the practice designs onto your doodle cloth , follow the instructions below and stitch. 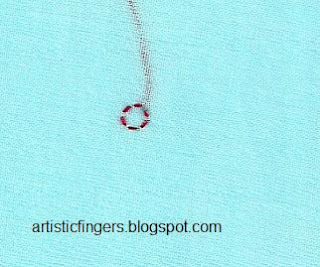 NOTE: I've used 2 color threads to show the interlacing here but use the same no. of strands and same color thread for both running and interlacing. 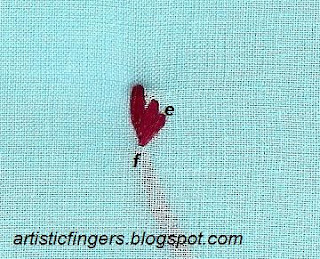 Step 1: A row of running stitch is worked first. To start interlacing bring the needle and thread up at ‘a’. 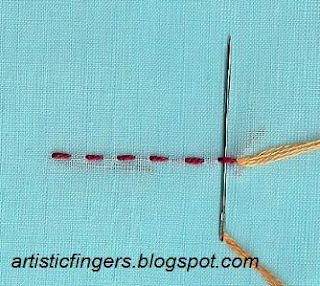 Step 2: Pass the needle under the first stitch as shown in the image above. Step 3: Pull the needle and thread. Step 4: Pass the needle and thread under the next stitch as shown in the image above. Step 5: Pull the needle and thread. Step 6: Pass the needle and thread under the next stitch as shown in the image above. Step 7: Pull the needle and thread. 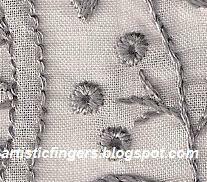 Notice the direction in which we pass the needle under each stitch for interlacing carefully. Complete the line which is marked as ‘D1’ in the design(refer stitch guide) with interlaced or laced running stitch. 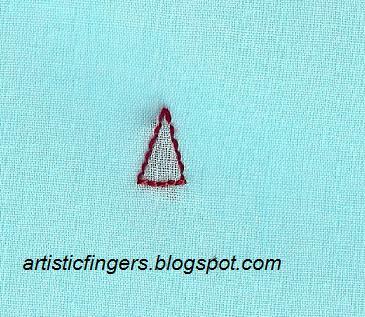 Complete the triangle shape which is marked as ’K’ with double back stitch starting from the ‘a’. 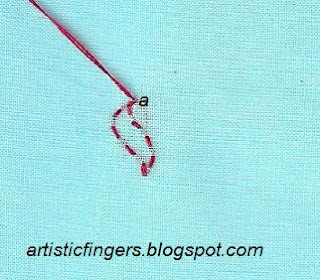 Do not end the working thread, complete the horizontal line at the bottom with back stitch and then end the working thread. Feel free to leave a comment or send an e-mail if you have any doubts in this lesson.